Cartoon Network is hosting a one-of-a-kind event to celebrate Adventure Time: The Complete Series DVD box set and soundtrack box set, including an exclusive fan signing and performances from the cast! Nucleus will be the first physical location to sell these items along with exclusive prints and other merchandise. Free gift with purchase. This event has limited occupancy. You must RSVP and bring your EventBrite confirmation, but it does not guarantee you admittance into the event. RSVPs on Eventbrite may not exceed (2) people per individual RSVP and those under 18 must be accompanied by their parent and/or legal guardian, who are over the age of 18. Cartoon Network will issue more confirmations to this event than event capacity allows. Entry is first come, first served. Come early, so you won’t be disappointed. The first 100 people to arrive will receive a special, designated wristband giving you access to the fan signing. Due to limited time, there is a 2 item limit per person that will be autographed. 1 item must be purchased at the Gallery Nucleus store. Cartoon Network will be filming and/or streaming this event. By RSVP’ing and attending this event, you consent that you and any children accompanying you may be recorded by Cartoon Network. If you do not want you or your child to be recorded, please do not attend. 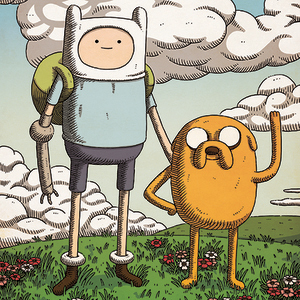 We look forward to sharing this moment with you and celebrating the iconic series that is Adventure Time! Your friends at Cartoon Network.